Paradise IMF(International Music Festival) is so powerful that it can unite individuals despite their differences. Kanye West and Wiz Khalifa put Twitter Beef Aside at Paradise IMF. 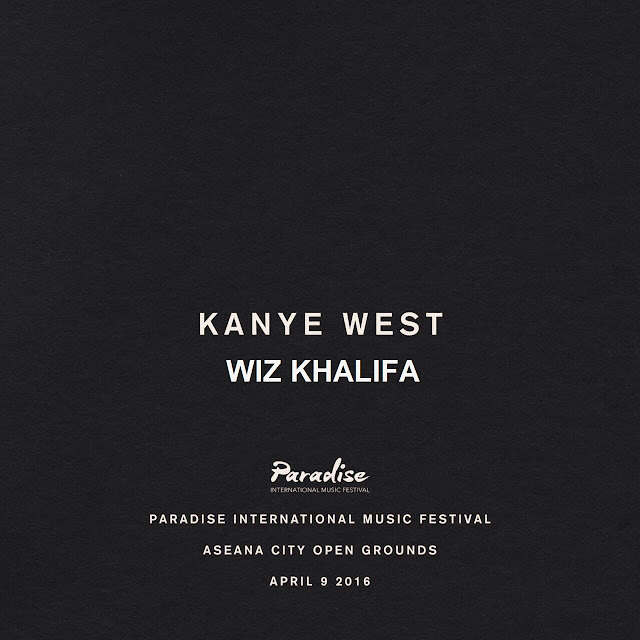 Yup KK, Kanye and Khalifa in one music festival! Yes, the two hip-hop moguls had an exchange of tweets that gone way out of proportion. It even involved their pasts on this Twitter beef. 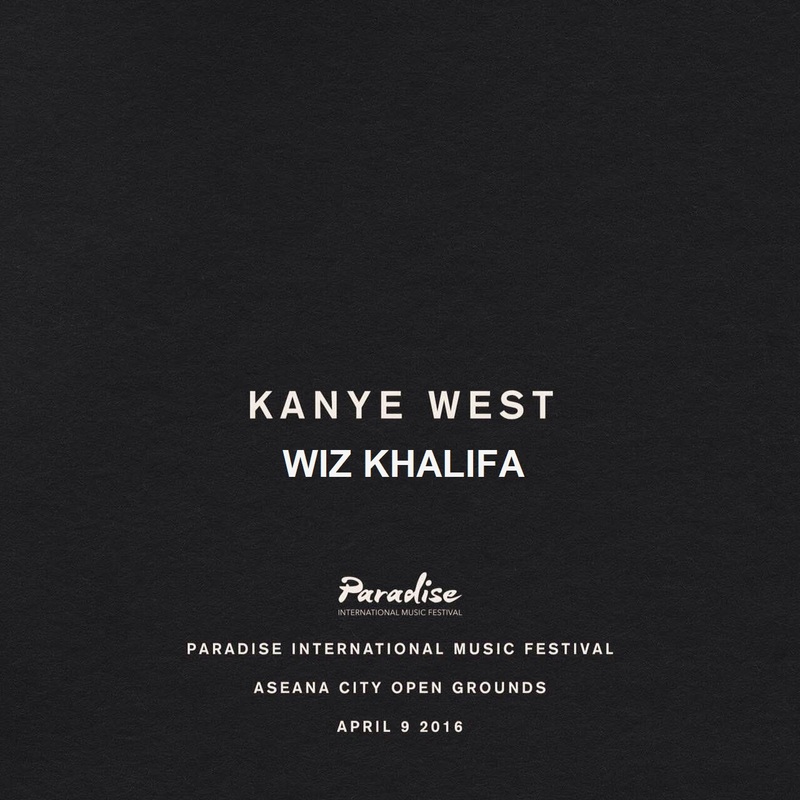 Following a surprise announcement, North Dakota rapper Wiz Khalifa is on deck to join Kanye West at Paradise International Music Festival and we can witness live here in Manila, Philippines this April 9th, 2016. The development catches the public by surprise as the two are set to share the stage just hot on the heels of their infamous Twitter altercation, wherein Khalifa called out West for intending to name his album "Waves," a title which Khalifa credits to rapper Max B, who many believe pioneered the "wavy" style of rap. West responded to Khalifa with a flurry of tweets, culminating in West telling the younger rapper, "I am your OG and I will be respected as such." However, the two appear to have squashed the beef after West tweeted that he just wanted to focus on positive vibes. Khalifa addressed the issue in an interview with radio station Hot 97, saying "(West) apologized and I accept his apology." But, the "Young, Wild, and Free" rapper also shut down speculation of a musical collaboration, saying, "We’re focusing on friendship. Let's focus on being friends first. It's all about love. You gotta tell your friends you love 'em." Watch this 12 minute videoclip of Wiz Khalifa sharing the recent happenings including the controversial twitter beef between him and Kanye West. Paradise IMF, being the first festival of its magnitude to pop up on Philippine shores, looks to be the perfect platform for the two artists to deliver on their messages of love and positivity. The much anticipated music festival will host a plethora of musical genres, with 8 international and 12 local acts, featuring names such as Swedish DJ Afrojack, British band Rudimental [DJ], young American artist Austin Mahone, and many more. Paradise IMF stage will be setup and held at the ASEANA City Open Grounds in Parañaque City, under Boardworks Media Entertainment, the people who also brought us international acts such as John Legend and Lifehouse, with Paradise IMF being its current magnum opus. Both Artists, just released their latest album this year. Kanye West released an 18-track album "The Life of Pablo" (Click here to listen) while Wiz Kahalifa's "Kalifa" album just dropped last month. Good thing it's all settled now. Let's spread positivity and trash that negativity behind. Let's all share good vibes on our way to Paradise... Paradise International Music Festival that is.